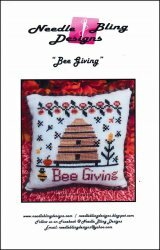 Bee Series: Bee Giving [W6678] - $8.00 : Yarn Tree, Your wholesale source for cross stitch supplies. Cross stitch pattern by Needle Bling Designs. Look at these busy bees! "Bee Giving," features a beehive with buzzing bees. Below the beehive, "Bee Giving," is stitched with a large bee stitched beside it. What a special gift for someone who takes care of bees. Stitch count 62h x 61w.